You can download the complete 2015-2025 SNAP from our Resources page. 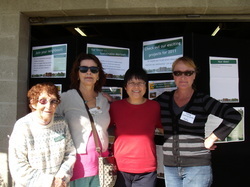 Our new Morisset and Peninsula Sustainable Neighbourhood Action Plan was launched at a community celebration held on Saturday 31 October 2015 at Yunung Community Garden at the Morisset Multi Purpose Centre. Above we have listed our long term goals up to 2025 to make Morisset and Peninsula more sustainable. Find out about our previous and current projects, and how you can help us achieve this community vision.